Simply put, a “wiki” is a website that is easy to use and edit without requiring an extensive knowledge of programming. Its purpose is to allow non-computer savvy people to post and edit information on a webpage. In effect, wikis operate in the “open-source” environment that the Rosenzweig article deals with. Secondly, unlike a private website which is a top-down experience (the “owner” posts, and the visitor reads) wikis are a collaborative effort in which all visitors can interact in a real-time environment. The most widespread wiki that all of us are most familiar with is “Wikipedia,” but wikis go beyond just that flagship product. The easiest way to describe PB Wiki (Now called PBWorks) is that it is a hybrid between Wikipedia and Google Docs. PB Wiki is specifically geared towards businesses where teams of people need to collaboratively work on a joint-project. Placing all of the information on a single, easy to use webpage that can be edited by multiple people at once in real-time, ends the time consuming practice of sending endless emails and cc’s to keep everyone updated with project changes. Aside from being strictly a business tool, wikis can also be used to foster creative collaboration across a wide spectrum of projects. For example, the Digital Research Tools site: https://digitalresearchtools.pbworks.com/w/page/17801672/FrontPage is a wiki that is publicly available. It serves as a database where people can post tools that help scholars conduct their research more efficiently. Unlike a “normal” website, on Digital Research Tools if you or I came across an effective tool and wanted to share it, we would be able to post our information on that wiki for all to see and interact with. Some of the more common wikis I came across are not related to business or academia, but are run by hobbyists and enthusiasts. For example: http://corvette.wikia.com/wiki/Corvette_Wiki is a wiki created by and for Corvette owners who can share tips and information on how to repair or upgrade their cars. If you own a Corvette and have discovered an easy way to fix a common problem with the car, you can post your instructions here to the benefit of all Corvette owners. This type of usage is exactly what wikis were built for – allowing for many different and otherwise unconnected people to come together and share common information. If you’ve ever had to do research in an archive or been lucky enough to have to transcribe original documents, sometimes it may seem like there’s no end is sight (especially if you work at one of the archives or libraries trying to find a way to transcribe and digitize your collection). This article was a short interview with Nicole Saylor, the head of Digital Library Services for the University of Iowa Libraries. Like untold numbers of historic sites and libraries with Civil War collections, Saylor and the University of Iowa Libraries began looking to try and transcribe their vast Civil War diaries and letters collections in anticipation of the 150th anniversary of the Civil War (which started this past July). But they quickly realized they were short on man-power, money, and time. What is a digital librarian to do? Well, ask and you shall receive! Saylor and her colleagues “crowdsourced” the Civil War by digitizing the letters and diaries and making them available to the public. They created a website where transcribers can choose a document, transcribe it in a niffy box, and email it to them for review. The letter I transcribed last week is being reviewed by Saylor’s team as we blog! Saylor said she had no idea how successful the project would be, and even faced resistance from staff members asking “is the public qualified to transcribe?” She simply stated they weren’t looking for perfect, but for engagement. Well thay certainly got that and more, when the site crashed it first day due to the overwhelming traffic. Several transcribers who have spent numerous hours on he project have told Saylor they feel as if these writers have become members of their family. Gotta love Civil War nerds, right? This project at the University of Iowa Libraries is very similar to the “What’s On the Menu?” project being undertaken at the New York Public Library. Both projects represent steps towards not only engaging the public, but actively enlisting their participation in the continued success of the collections and institutions. Such a project ten years ago would have been unheard of! But not all historians necessarily feel the same. Engagement and participation, yes. But the public transcribing? Can that be their domain as well? The internet has opened up questions of authority and ethics for historians. Is transcribing something better left to eager interns and historians? Or could we think of other institutions who could benefit from reaching out to the public for their help? What potential downsides could such a project create? Would it be more time-consuming to weed through other transcribers work that to do it yourself? Whether you’re a Civil War nerd or not, it is a very cool idea that you have been a part of preserving part of the past. So go on, and pick a letter to transcribe! 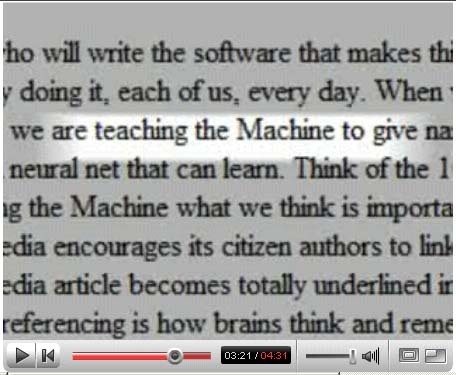 The The Machine is Us/ing Us is a video uploaded in 2007 by Kansas State professor Michael Wesch. The video presents an overview of the internet & Web 2.0 but perhaps the most interesting part of the entire video is the ending. Wesch puts the recent advances of technology into perspective, raising important thoughts that are just as relevant as ever. Despite reaching over 11 million views the Cultural Anthropology professor did not intend to make such a popular video that the blogosphere would quickly take by storm. In fact Wesch originally created the video for his Digital Ethnography class and sent it only to his colleagues to gather feedback. From there it spread and the video was being mentioned in blogs & used as a discussion piece in courses. With the SOPA & PIPA controversy at barely two-weeks old it breathes a new life into the videos declarations of rethinking; copyright, authorship, identity, ethics, governance, privacy, and ourselves. The truth is that we can never fully be done addressing these issues, because just like technology itself they will continue to evolve as time goes on. I believe this cause for reevaluation is healthy. It has been easy to become indifferent to certain issues such as copyrights that have manipulated by companies such as Disney, despite their ironic recent misstep. Through all of this it has become clear that those who do not understand the internet technology change are naturally fearful of it. 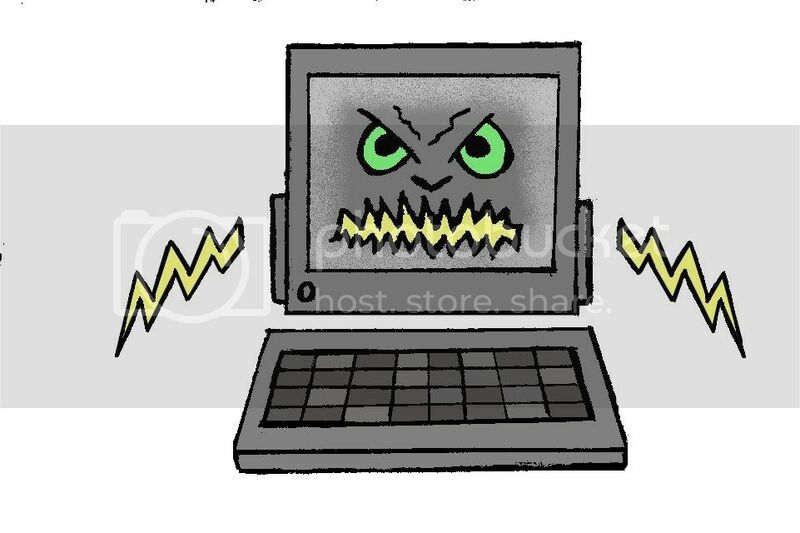 The internet & Web 2.0 has had it’s fair share of criticism; from the MPAA & RIAA lobbying against ‘online piracy’ to the fear of over-personalization. Even the title of the ‘Machine is Us/ing Us’ implies a negative & fearful expectation for the audience. But the constant bashing of personalization & cautions of ‘the computer learning too much’ is something I do not agree with. In fact, I feel that this is something that we should very well embrace. Yes, the computer does learn from us. This is great. What is the worst thing that has happened to someone from this? Receiving ads that are relevant to your latest google search? Also the idea of ‘us’ being the machine is something that can be easily construed into a straight-to-DVD horror story. Human computation is in my opinion one of the greatest and sophisticated concepts today. Just ask Luis von Ahn, a Professor at Carnige Mellon who has taken the human computation concept to the next level. First by integrating it into his invention of captchas (those funny looking human-checks) by helping digitize books & his latest project Duolingo having users translate the web while simultaneously learning a new language. For more in-depth info you can watch this TEDxTalk of his I was able to see in person. The most important part of all of this is the emphasis on discussion and I believe this is what Wesch was getting at. His video seemed to not have the message to be timid/afraid about the future of technology but instead be aware of it. Instead of reacting to the evolution of technology with caution we should discuss it, test it, push it to its limits, see what happens, learn from it, and continue to do great things that change the world. The New York Public Library runs a database called “What’s on the Menu?” The database’s organizers have scoured restaurant menus from the 1840s until the present day to illustrate the kinds of food people ate and how much they paid for their meals. This website shows that when used as primary sources, menus provide fascinating insights that tie cultural, economic and social history together. The website breaks down into a few headings, perhaps the most important of which are entitled “Menus,” “Data,” Dishes,” and “Blog.” By clicking on “Menus,” visitors can see pictures of actual menus from restaurants from the nineteenth and twentieth centuries. Viewers can click on the images to see them in larger, blown up versions that are easy to read. I am not entirely certain as to what the “Data” section is supposed to be used for. The database’s designers encourage viewers to use this section for their own research and projects, but unfortunately the “data” that the website offers is largely unreadable. There are a few links that open up as Excel documents, but when I looked at them they were largely written in “computer language” that seemed to have no rhyme or reason and appeared to lack significance. The “Dishes” section allows viewers to explore specific items from various menus. Clicking on “Fruit Salad with Whipped Cream,” for instance, takes viewers to the exact menu and page that the dish is found in. People can then see exactly how the dish was classified (as an “entrée,” “appetizer,” etc.) and how it compares in price to other items. The “Blog” section brings viewers to the New York Public Library’s main blog. Unfortunately, there isn’t an abundance of posts related to What’s on the Menu? However, the blog is useful for highlighting what else the New York Public Library is focusing on at the moment. The Library admits that the database is a work in progress. The project began last year and so far, the project seems off to a solid start. However, it still has a long way to go until it is complete. As noted above, the “Data” section needs to be re-examined. Project organizers are also adding more menus and descriptions of items. They want to include more menus that actually describe what each dish includes and do not simply list what a restaurant offered. These images will undoubtedly provide even greater details about what people ate and how their food reflected social and economic issues of their time. As it progresses, I can see how the site can be an interesting and valuable tool for historians and anyone intrigued by the intersections of food and culture. The one persistent thought that ran through my mind as I explored this site was that it raises the following question: What exactly can (or should be) considered “historical evidence?” Prior to seeing this site I had never really thought about how menus can serve as historical evidence that can teach us valuable lessons about an earlier time, but the site makes a convincing argument that menus can indeed do so. When thinking about what kinds of primary sources to use in my research, I typically think about the traditional evidence that historians use: letters, journals, speeches, music, etc. What kinds of “different” sources have any of you used in your research? For public history students, what does the study of public history tell us about what can be considered a legitimate primary source? Roy Rosenzweig’s “Can History be Open Source?” brings up many relevant questions concerning the relationship between academic history/historians and Wikipedia. Though he ultimately supports a greater integration of historians into open source, free Internet sites such as Wikipedia, the beginning of his article thoroughly outlines the seeming incompatibility between the “laws” of historians and the set up of Wikipedia. Besides his premise that history is a “deeply individualistic craft” rather than a communal effort, his most important insight for me was Wikipedia’s emphasis on neutrality. As future/current historians, we all know the value and necessity of arguing a point in our works. To this end, in addition to the weaker bibliographic information, anonymity, deemphasis on status (an individual with a PhD is not given prominence over a “typical” Wikipedian), and different value placed on certain facts (such as in the section where he is talking about James McPherson and what Wikipedians emphasize in their post on Lincoln as opposed to McPherson, or where Rosenzweig states Wikipedia is fueled more by popular news than academic historiography), Wikipedia appears to be the antithesis of “proper” history. However, Rosenzweig is successful in two things: his attempt to legitimize the facts and articles on Wikipedia as factual, and arguing the venue of Wikipedia (as a free, open source, easily accessible site) would be a wonderful and important avenue historians could take to integrate a wider audience into historical works and debates. His point that Wikipedia is also run/edited by white, educated males and has a Western bias was also a very interesting point in regards to discussing history. Honestly, I use Wikipedia to look up what year so-and-so was born. Or what year that movie was made. And that’s about it. I cringe, I’ll admit, when student cite Wikipedia as a source in their papers. Yet this article did somewhat assuage my fears that their information was entirely misguided. Despite the potential, as Rosenzweig outlines, for false information to stay on the site, Wikipedia apparently is factually accurate in general. While I would love for journals like the JAH to be online, free, accessible, I don’t believe it would either catch on like Wikipedia has, nor do I think it would open the pool of who was posting in these journals. I also agree with Rosenzweig that a majority of professional historians are not ready or willing to give up the tenets of their profession, such as hierarchy among PhDs, antiquarians, etc. Maybe these historians are the ones whose retirement we were discussing last week, but as it is, Wikipedia and academic history, though they have some crossover potential, are at this moment still inherently yin and yang.